While both sides of the monastery house hostels for the monks amidst manicured lawns, the main structure is nothing less than a spectacle, literally. As we walk towards the monastery, I gawk at the intricate wooden carvings of flowers, leaves and other symbols of Nature that adorn the walls. 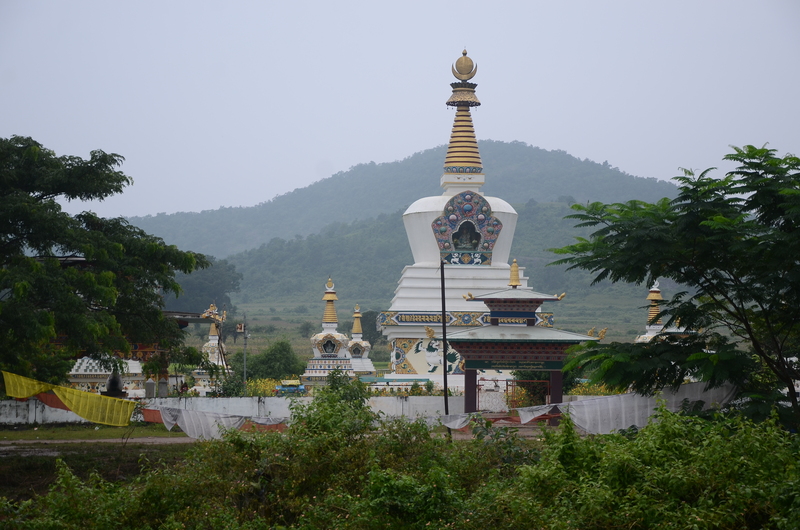 Art and folk tales of Tibetan Buddhism whisper from every corner of the monument. Looking up at the ceiling I see colourful paintings of mountains, deer, lotus, clouds, streams and waterfalls – all motifs of Tibetan art – besides, different ‘mandalas’ that signify transformation of soul. There are paintings of the phoenix and dragon as well which symbolise the yin and yang forces in the universe. I am told that underlying these works of art is a complex set of beliefs that promise to guide a soul towards the path of enlightenment. After a quick tour, we step into the huge meditation hall whose entrance is decorated with paintings portraying Buddha’s life cycle – from a common man to being the enlightened. Artistic representations of the guardians of Heaven and Hell also find space on both the sides of the entrance. At the centre of the meditation hall, sits a 23-foot golden coloured statue of Buddha, flanked by 17-foot-high statues of Lord Avalokitesavara (Embodiment of Compassion) and Lord Padmasambhava on either side. The idols are set against beautifully done murals depicting Mahayana and Vajrayana Buddhist traditions. I can barely take my eyes off the colourful murals on the walls that are punctuated with golden hue depicting Buddhas and Bodhisattavas, Dakinis and Dharmapalas, Sun and the Moon (regarded as symbols of God), deer, wheels and various mantras, which are ingrained in the Mahayana and Vajrayana systems of worship. “While in Mahayana sect, monks worshipped idols; they developed a complex set of mantras, mandals and symbols in Vajrayana sect. The paintings are not just mere paintings but a depiction of the process to put the viewer, the individual Buddhist, in touch with what the Tibetan tradition calls the ‘One Mind’ or absolute consciousness,” Patnaik explains. I enjoy a few minutes of silence in the hall as I watch young monks settle down for the afternoon prayers. It is easy to open conversation with the monks for whom, discipline is the way of life. The annual cultural calendar of Padmasambhava Mahavihara monastery hosts a series of events that are related to Lord Buddha. However, the most important among them is the month-long Saga Dawa festival that is celebrated in April. Jirang witnesses a mammoth gathering in April as Buddhist monks from across India and Nepal come here for prayers that continue throughout the day for all the 30 days in the month. Apart from the monastery, travellers can visit the beautiful Khasada waterfall that is on the outskirts of Jirang and the Tibetan Cooperative Society of Chandragiri, located four kms away, where the refugees prepare handicrafts. Two popular tourist destinations of Southern Odisha – Taptapani, a hot sulphur spring and Gopalpur sea beach – are 40 kms and 100 kms away from Jirang respectively. The monastery runs a canteen where visitors can have their food.